Returning to the land of the living, the heroes explore the ruins of the town of Roslar's Coffer, the center of the devastating blast that hurled them to the afterlife. 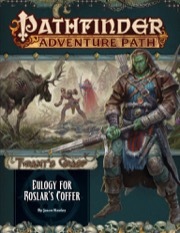 Populated with newly risen undead, twisted creatures, and wicked cultists of the Whispering Way, Roslar's Coffer offers danger around every corner. Can the heroes escape the poisonous fog that surrounds the town and warn the rest of the world of this rising threat to all life? A presentation of the machinations and representative members of the nefarious death-obsessed Whispering Way, by Crystal Malarsky. I can't find a product page for the first book, but the description for this volume spoils not only the beginning of book 1, but also the end. The whole starting dead and returning to life at the beginning isn't something to spoil. It's one of the draws. This isn't information we're hiding. The fact that you start out this AP dead and must struggle to return to the land of the living with information you've acquired is something we want people to know about. It's one of the things that sets this AP apart (and makes it awesome!). I was under the impression that the pc's would start this AP alive and be killed at the beginning of it, which would be a much greater shock to them, only to then find out that they are somehow able to find their way back to the land of the living. But it seems that the blast that killed them (and everyone in Roslar's Coffer) has happened before the game even starts or in a flashback. If this AP follows the tradition of articles about gods and deities in second volume, I ask myself which of the divine powers would be linked to this adventure. Maybe a closer look into Xibalba or the demigods of the sahkil? We are practically going to fight against death itself in the first volume - death, not undeath, but that as well - so this would be fitting. Where in Avistan is Roslar's Coffer? It's kind of at the border between Lastwall and Ustalav. Who's that Halforc on the cover? Kess & Imrika vs. an undead elk looks kinda funny. I'm wondering if green skinned person is another type of undead since there is green skinned gnome on next volume's cover .-. Woo an article on the faith of Arazni will be so cooL! Wonder if it has anything to do with the new race that's linked to undead ??? Undead moose! Their bites are pretty nastï! Am...am I FINALLY GONNA GET TO PLAY A FRANKENSTEIN?! GREEN SKIN AND ALL! Maybe they both are "mortics", the new playable undead race introduced in AP# 139? Correction: it's on the border between Lastwall and Nirmathas. It's about as remote as a town can be in Lastwall, and still be in Lastwall. A lot of what's happened to her hasn't been her choice. Not for a long time. Thank you for the correction, Ron. I was basing it off some other map I guess. So, is someone a fan of the Resident Evil film franchise? Now has it been about ten years since the Inner Sea World Guide? Because does this AP issue deal with Rosler's Coffer at that time being abandoned. Also will we get an appearance of The Red Warden, the red reaver that took up residence there. I know, I want all the answers early. LOL! While it is true that the book likely takes place 10 years after Inner Sea World Guide state of the world, do note that Inner Sea World guide stated that Rosler's Coffer has population of 435 :P Aka it being abandoned due to orc raiders was "many seasons ago" from point of view of World Guide and it was already repopulated by then. You may be interested in PFS #10-04 Reaver's Roar. I don't know about the green guy, I mean, why couldn't he just be a Half-Orc? 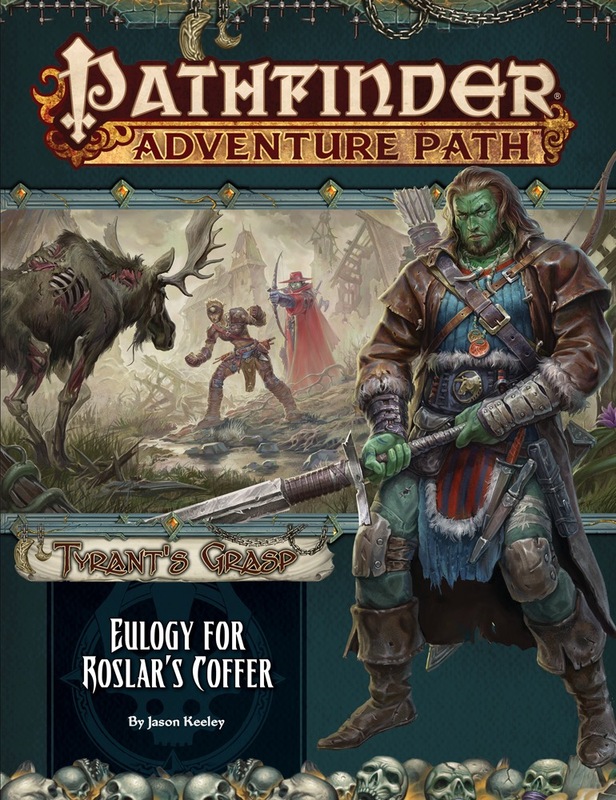 I see the other cover with green skinned gnome (Lini? ), but is it canon than Gnomes can't have green skin? Well there is green skinned person on cover of player's guide too. I'm interested in the new Couatls and whether or not they'll be from mythology. There are quite a few types of Aztec serpent monsters with Couatl in their name, but most of them aren't particularly Celestial-ish. Anyone get their PDF yet? They should start shipping any time now, so I am pretty sure nobody has their PDF yet. Anyone got there subscribers PDF and willing to spill some details? Arazni is quite the mythic thread. Eight tiers of Marshal. Really makes me ask myself how the Whispering Tyrant measures up to her (or to Sorshen and Xanderghul at his full power). Both their stats were published in Mythic Realms years ago. BTW, "threat". I'm sure she also would spawn a mythic thread. I really should check my spelling more before and after clicking "post. Also, I haven't read Mythic Realms. Both stat blocks are also on Archives of Nethys under the mythic monsters section. I don't suppose we can get some alignments for those monsters? Greetings to all and sundry! This is Mikhail Rekun, and I wrote one of the monsters at the end of this AP -- the Gurgist, everyone's favorite terrifying masked horror who isn't really that bad. As ever, a massive thank you to Ron Lundeen for sending this my way, along with big bunches of ideas to ponder. And likewise, what follows are some random comments that are not in any way official. Stylistically, the Gurgist grew out of thinking about hungers, while trying to avoid the usual zombie tropes (nothing wrong with those, but we were aiming at more than just 'cannibal humans'). So, I was thinking about hunger as a central theme, and addiction, and I was reading Discworld, and a little light bulb went up above my head. For those sorry souls among you who have not read Sir Terry's Discworld series, vampires there often become teetotalers, displacing their addiction to blood for something else. Now, in Sir Terry's books, this is mostly played for laughs. So I started thinking of how to make it creepy (leading to the obsession skills). And then one of my friends showed me something that involved masks, and a second light bulb went on. Creepy masks! Masks make everything creepy! (My players are now rolling their eyes a bit). Maybe not the most original idea in the history of gaming (creepy masked dead things are a thing), but hey, it works. Fun fact: As often neutral critters, they can also be creepy-cool allies. So, this is where the Gurgist came from. I'm rather proud of them, and I'm really proud of the artwork that came with them. Seriously, it's amazing. Mechanically, Gurgists are slow-moving rogues. They have the zombie vibe, and then they rush up to you and sneak attack you (ideally, they're fighting in groups and set up flanks). Whereupon they are zombies dual-wielding daggers and hitting you for way too much damage. Hope folks enjoy reading them as much as I enjoyed writing them, and with luck a few PCs will get to go 'urk' at being stabbed repeatedly.